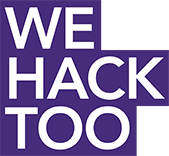 We Hack Too is only a few days away, so get excited! If you just signed up on devpost and would like to participate in our 1-day event on June 24th from 8:30am-7pm in select Microsoft stores (check wehacktoo.org for locations), please let us know ASAP by emailing bstembusiness@gmail.com. There will be free food, great prizes up for grabs, and tons of professionals (from Snapchat, Hulu, SurveyMonkey, IBM, and more!) mentoring you every step of the way. Questions? Feel free to email us at bstembusiness@gmail.com.